Cosequin, a nutritional supplement, safely and effectively provides joint cartilage support while maintaining your cat’s comfort level. Some veterinarians also recommend Cosequin to help support urinary bladder health. 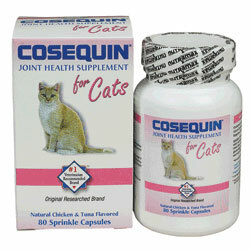 Cosequin for Cats contains natural chicken and tuna flavored capsules specially formulated for cats.